Call Forex Cargo today to have your balikbayan boxes Picked Up!!! Forex Cargo’s Forex De Mayo Promo Is Back!!! Every year, Forex Cargo customers look forward to the month of May in anticipation of the yearly Forex de Mayo Sale. This year is no exception, as early as March, a lot of customers have been asking about the promo and to give in to numerous requests, Forex Cargo balikbayan box decided to offer the sale a week earlier. As always, Forex Cargo Balikbayan box company would like to thank all of our customers who availed of this promo. 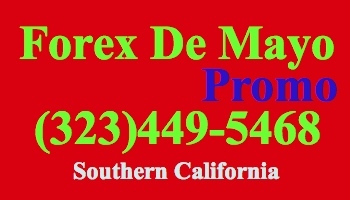 To schedule a Forex Cargo pickup, pls call (323)449-5468. Thanksgiving Day is the time to offer thanks not just to our customers but to our co workers, friends, family and loved ones. We hope that everyone will have the opportunity to spend time, enjoy with their friends and relatives as well as be thankful for all the blessings. An annual holiday that is celebrated as a day of giving thanks, It’s a time for sharing and spreading happiness. Here at Forex Cargo, we just want to wish everyone a Happy Turkey Day!! !